Meet Joanna Guldin: the woman behind “Jo, My Gosh! Stories and advice that feel like coming home”. 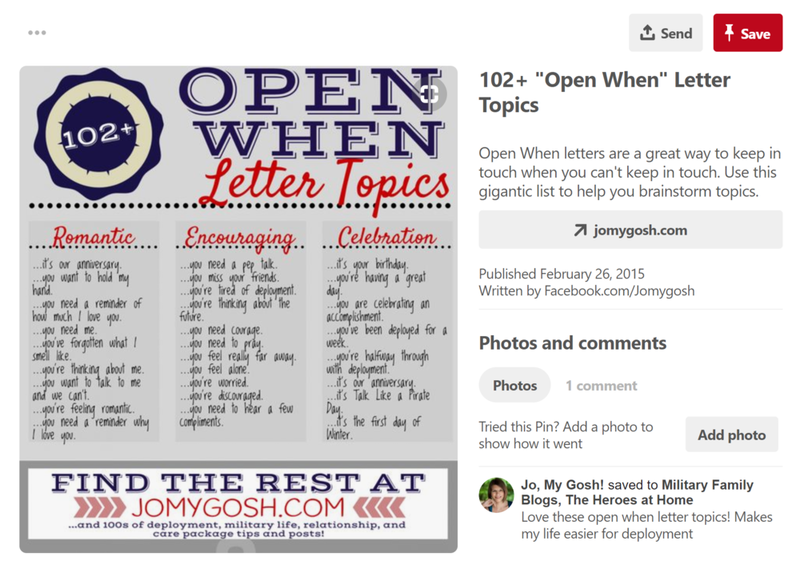 Jo is a military spouse blogger that writes about military life, relationships, and resources for the military spouse community. She was kind enough to answer my Pinterest business questionnaire so I could talk a little about Pinterest for her blog and give her some profile tips. I'm always looking forward; so I'm always looking to learn about new trends that will take us into the future as far as Pinterest and social media go. There are a few key elements of Jo’s profile and website I want to touch on that are worth noting. She’s been blogging and on Pinterest for a long time (as far as the online world goes) and her content (and website) still feel fresh and updated. Brand look and feel, as well as user experience are really important. As you can see from her most popular pin, it’s from 2015...3 years ago! This is a common occurence on Pinterest and the “evergreen” element of your content is what makes Pinterest such a powerhouse for your marketing. Jo obviously knows this is her most popular pin because it’s highlighted on the home page of her website and leads to a marketing funnel - smart move! Jo’s Pinterest profile has great keyword descriptions and rich pins are enable for pins from her site - both super key for Pinterest success! Her pin graphics are on-brand and consistent - another necessity for this visual platform. Overall, Jo has done an amazing job with Pinterest and obviously knows her way around the block. Jo has A LOT of boards and is on lots of group boards as well. With the new followers tab, businesses need to be more conscious about what kind of followers they’re attracting. Does Jo want followers that find her because of her “Colonial Christmas Decor” board? Probably not. She’s better off making the boards she uses for personal projects and ideas into secret boards. While Group Boards were a great strategy for maximizing the reach of your content, being on under-performing boards will actually hurt your profile. If Jo is using Tailwind she can navigate to the Board Insights feature to see which boards are performing well for her and which ones she should consider leaving. I recommend looking at the Board Insights stats on Tailwind at least 2x per year (or once a quarter) to leave underperforming boards. Next, Jo should review her board titles and descriptions. The keywords here are second-only in importance to pin descriptions. Some of her boards are good to go, such as Military Spouse & Significant Other Resources - the board title is specific and keyword-rich, as is the description. However some of her boards need a little keyword-love, like Featured Crafts that are lacking in this area. Remember - Google will index your boards in their search (not just Pinterest) so being thorough and complete with your keywords across your profile is important. Lastly, for Jo’s most popular pin I would go back and edit this particular pin description to include more keywords, 3-5 hashtags, and the specific url she directs this to (even though it’s linked with the pin itself). It’s not worth going back through every pin (especially in Jo’s case because she is a content machine!) to edit descriptions, but for top-performing content it’s a great idea. Looking forward for Jo, I love that her most popular pin leads to a content upgrade. This is how Pinterest is supposed to work! If she hasn’t already, she should start with Promoted Pins to kick that content upgrade into overdrive. Thank you to Jo for participating in this Pinterest Business Spotlight and for everything she does for her incredible community! *Yes...this page does contain affiliate links. Please know that I would never, ever recommend anything I haven't used and love. Affiliate links are no extra cost to you and they support my caffeine habit. Are You A Proactive Or Reactive Small Business Owner?